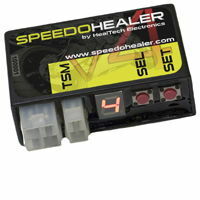 The SpeedoHealer is an inexpensive, convenient and very simple way to fix your speedo and odo. 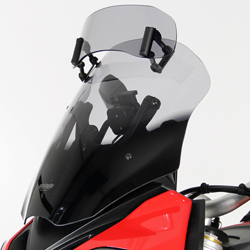 Compatible with all motorcycles with non cable driven speedometer. "Great! It's nice to look at the speedometer with confidence that it's showing an accurate reading. Worth the money? Absolutely. It's not terribly expensive as farkles go, it's easily disabled and re-calibrated and--best of all - I finally know exactly how fast I'm going." Whats new in Speedo Healer V4? 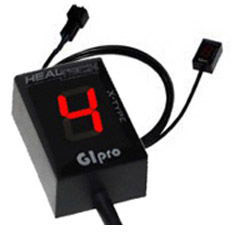 !quote, electronics, speedo, healer, healtech, heal, tech, heel, heeltech, healtek, tek, heeltek, 109, 125, 150, 150nk, 250, 250r, 250sl, 300, 400, 400r, 450, 500, 530, 599, 600, 620, 650, 650f, 650nk, 650r, 650tk, 660, 675, 67r, 690, 695, 696, 749, 750, 750f, 796, 797, 800, 800xc, 821, 848, 850, 900, 910, 950, 955, 955i, 954, 990, 999, 1000, 1050, 1078, 1078rr, 1090, 1090rr, 1098, 1100, 1125r, 1125cr, 1199, 1200, 1250, 1290, 1300, 1300r, 1400, 1400gtr, 1500, 1600, 1700, 1800, 2000, africa twin, agusta, america, an250, an400, an650, aprilia, benelli, bandit, big, bking, b-king, big bear, blackbird, blade, bmw, bolt, bonneville, boulevard, brutale, brute, bt1100, bulldog, buell, burgman, c50, c90, c109r, c109t, c800, c1500, c1800r, cagiva, can-am, canam, caponord, cb250f, cb300f, cb400f, cb400sf, cb500f, cb500x, cb600f, cb600s, cb650f, cb900f, cb1000r, cb1100, cb1100ex, cb1100sf, cb1300, cb1300sm cb1300f, cbf250, cbf500, cbf600, cbf1000, cbf1000fm cbf1000fa, cbr125r, cbr150r, cbr250r, cbr400r, cbr500r, cbr600f, cbr600fs, cbr600rr, cbr650f, cbr900rr, cbr1000rr, cbr1100xx, classic, cfmoto, cmx300, cmx500, concours, crf250l, crf1000l, crossrunner, crosstourer, cross country, ctx700, ctx1300, daytona, dl650, dl1000, dn-01, dn01, deauville, delphi, desmosedici, diavel, diese, diversion, d-tracker, dorsoduro, drag, dragster, dragstar, duke, enduro, er4f, er-4f, er4n, er-4n, er6f, er-6f, er6n, er-6n, etv1000, european, f3, f4, falco, fazer, fire, fireblade, firestorm, fjr1300, fk600, force, freewind, fury, fz-07, fz07, fz-09, fz09, fz1, fz150, fzs, fz-s, fz16, fz-16, fz400, fz6, fz6r, fz8, fzh, fzh150, fzn, fzn150, fzs, fzs600, fzs1000, g450x, gilera, gladius, gl1800, goldwing, gp800, grom, grizzly, grs, grs600, gsf, gsf600, gsf600s, gsf600n, gsf650, gsf650s, gsf650n, gsf1200, gsf1200s, gsf1200n, gsf1250, gsf1250s, gsf1250n, gsr, gsr400, gsr600, gsr750, gsx, gsx600f, gsx650f, gsx750f, gsx1250fa, gsx1300r, gsx1400, gsxr, gsx-r, gsxr600, gsx-r600, gsxr750, gsx-r750, gsxr1000, gsx-r1000, gsx-r1000r, gsxr1000r, gsxs750, gsx-s750, gsxs1000, gsxs1000f, gsx-s1000, gsx-s1000f, gtr1400, guzzi, harley-davidson, hawk, hayabusa, honda, hornet, husqvarna, hyosung, hypermotard, hyperstrada, inazuma, indian, integra, interceptor, interstate, intruder, katana, kawasaki, kfx, kfx450r, kl250, kle300, kle650, klv, klv1000, klx, klx125, klx250, klx450r, ktm, leader, lightning, m50, m90, m95, m109r, m109r2, m800, m1500, m1800r, majesty, marelli, marauder, master, mille, monster, morphous, moto, motoguzzi, mt01, mt-01, mt03, mt-03, mt07, mt-07, mt09, mt-09, mt10, mt-10, mt125, mt-125, midnight, mule, multistrada, msx125, mv, mvagusta, navigator, nc400x, nc700s, nc700sd, nc700x, nc700xd, nc750s, nc750x, nc750sd, nc750xd, ninja, ninja-650, nrx1800, msa700a, nt700v, octane, pan, pan-european, pcx125, pcx150, pegaso, polaris, raider, raptor, rc8, rc51, rebel, rhino, road star, roadliner, rocket, iii, royal star, rsv, rr, rsv1000, rsv4, rune, rvt1000r, s2r, s4, s4r, sabre, scrambler, sfv, sfv400, sfv650, sh125, sh150, sh300i, sherpa, shiver, silver, silverwing, SL1000, smc, sp, sp1, sp2, speed, speed four, speedmaster, sport, sportclassic, sprint, sprint rs, sprint st, sprint spyder, gt, SR400, SR Max 300, st3, st3s, st4s, st1300, st1300x, stx1300, star, stels, street, streetfighter, super, superbike, superblackbird, superduke, superhawk, supersport, stateline, stratoliner, stryker, sv650, sv650x, sv1000, tdm, tdm850, tdm900, tenere, teryx, thurxton, thunderbird, tiger, tl1000r, tl1000s, tmax, t-max, TNT, tracer, tracker, tt, tt600, transalp, triple, triumph, trx, twin, versys, versys-x, v-star, vstar, v-tec, vtec, v-max, vmax, VMX1700, valkyre, valkyrie, varadero, victory, vl800, vl1500, vlr1800, vfr750, vfr800, vfr800x, vfr1200, vfr1200f, vfr1200x, vn900, vn1500, vn1600, vn1700, vn2000, voxan, vstrom, v-strom, vt125c, vt400, vt750c, vt750s, vt1300, vtr1000, vtr1000f, vtx1300, vtx1800, v-night, vrsc, vulcan, vz800, vz1500, vz1600, vzr1800, w650, w800, warrior, wild star, wing, wr125r, wr250f, wr250x, wr450f, wr450r, wr450x, x-11, x11, x4, x-4, xc800, xf650, xj6, xjr, xjr1300, xjr400, XL125v, xl700v, xl1000v, x-max, xmax, xb12stt, xsr700, xsr900, xt, xt250, xt660, xt1200z, XV950, xvs950, xvs950c, yamaha, ybr, ybr250, yfm, yfm550, yfm660, yfm700, yfz450, ys250, yzf-r125, yzfr125, yzfr15, yzf-r15, yzfr25, yzf-r25, yzfr3, yzf-r3, yzfr6, yzf-r6, yzfr6s, yzf-r6s, yzfr1, yzf-r1, yzfr1m, yzf-r1m, z125, z250, z250sl, z300, z750, z750r, z800, z900, z1000, z1000sx, zanella, zg1400, zrx1200, zx6r, zx-6r, zx6rr, zx-6rr, zx9r, zx-9r, zx10r, zx-10r, zx12r, zx-12r, zx14, zx-14, zzr600, zzr1400, naked, unfaired, 98, 99, 00, 01, 02, 03, 04, 05, 06, 07, 08, 09, 10, 11, 12, 13, 14, 15, 16, 17, 18, 19, 00, 1998, 1999, 2000, 2001, 2002, 2003, 2004, 2005, 2006, 2007, 2008, 2009, 2010, 2011, 2012, 2013, 2014, 2015, 2016, 2017, 2018, 2019, 2020!